Eight ordinary Japanese living during World War II in the home islands, except for two men in the military who also served outside Japan, wrote the diary selections included in this book. 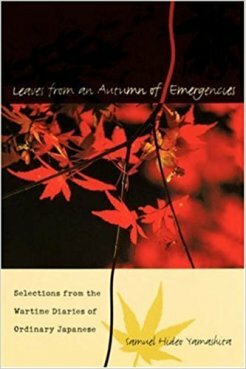 The diverse writers include two upper elementary school students who evacuated to the countryside to escape fire bombings of the large cities, a Tokyo housewife who had doubts early in the war about the Japanese military's resources to wage war in scattered and distant places, a Kyoto man in his mid-70s who had operated four billiards parlors but by 1945 had only one open, an Army soldier in Okinawa who hid out in the hills from the invading Americans until one month after surrender had been announced by the Emperor, and a secretary in Tokyo who kept a record for her employer while he served in the military. One diarist, Yasuo Itabashi, died in a special (suicide) attack as a Kamikaze Special Attack Corps member on August 9, 1945. Another diarist, high school student Shōko Maeda, worked at Chiran Army Air Base in Kagoshima Prefecture for over three weeks to assist special attack pilots in cleaning their barracks, doing laundry, and mending clothes. Samuel Yamashita succeeds in his aim for the book, which is to offer a "glimpse of how the war affected eight ordinary Japanese people and how each responded" (p. 11). Although the Introduction begins the book, it seems preferable to read the diaries first so that themes can be identified by one's own examination of their contents. The diary translations include footnotes that assist in understanding the context and language. Many diary entries describe food shortages, especially near the war's end, with common people barely able to survive on limited rations and what could be purchased on the black market. Reading diary entries can be unexciting, since sometimes references to events and persons are not clear, and often the writing deals with rather mundane matters. Regardless, readers will be rewarded by finishing these eight diaries by a much better understanding of how normal Japanese people lived and thought during World War II. Yasuo Itabashi's diary starts on February 18, 1944, the month when he left the Japanese home islands for Pacific air bases such as Truk from where he flew combat missions. Although he died in a kamikaze mission on August 9, 1945, his last diary entry below is dated four months earlier on April 8 (p. 79). The engines of our planes were in great shape, and we were in good spirits. This time—I'm definitely not expecting to return alive. Yasuo is happy and will go off to die laughing. All I can do is aim my aircraft, and it may not be something I can laugh about, but I expect to be laughing at the moment I crash. In any case, please try to imagine this. I wasn't able to do anything filial and apologize for this. Next, about my financial affairs, please use all my money to pay the cost of constructing a plane. Thank you for all the things you did for me. I'll seem a complete stranger if I say this, but from the bottom of my heart, thank you for your many kindnesses. I will happily go off dreaming of the day of victory. Please put up a good fight until the day of the final victory. Finally, I pray for my honorable parents' good health. Itabashi's diary presents several difficulties in truly understanding his feelings about his wartime experiences, but the diary excerpt above shows that he fully supported special attacks even though they resulted in death. The diary entries generally do not give the location, which sometimes makes it difficult to understand certain comments since he moved so many times between air bases around the Pacific and Japan. Itabashi did not continue his diary for the four months between the time he transferred to Kokubu Air Base in southern Kyushu, apparently for a special attack, and the time when he actually took off in kamikaze squadron, so readers only get his initial reaction to the news of his assignment and do not know whether his views changed. Itabashi's diary entries have time gaps as long as several weeks, so at times they seem to jump abruptly between topics. In contrast, the diary of Seiki Nomura, the soldier who hid out in Okinawa from enemy troops and did not realize the war had ended includes entries almost every day from August 2 to September 14, 1945, which makes it easy to follow his thoughts and emotions during this period. According to the two diary entries below (p. 64), Itabashi was assigned to, rather than volunteered for, a kamikaze squadron in the Philippines. Later diary entries, only three between November 15, 1944, and January 3, 1945, reveal nothing more regarding his reactions to this assignment to a kamikaze squadron and explain nothing as to why he did not actually make a kamikaze attack in the Philippines. There are few pilots left. 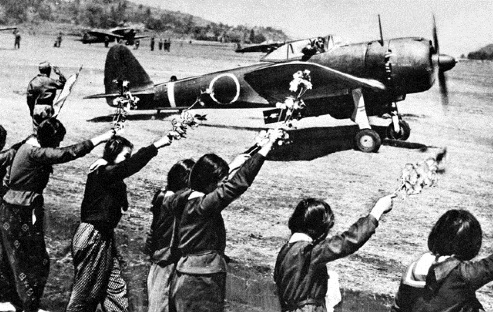 The division leaders flew off to Kokubu Air Base. I went to the First Air Fleet Headquarters in Manila, and my fate had been decided. I learned I'm in the same divine wind special-attack squadron as Second Lieutenant Kunihara and Sergeant Asao Hiroshi, which surprised me. The 503rd Air Group has been decimated. There are just a handful of survivors. Like the others, I'll go off on a special attack. Everyone wants to join his friends. I'm just amazed by the strange tricks fate plays on us. My thoughts are on the future toward which the country moves. The poem has a logic. I find it congenial. Yet what sort of state will exist without victory? Will the Yamato people still exist if we're completely defeated? We'll give up our lives for the sake of victory. Happy and laughing, we go off to crash — one plane, one ship — and there is nothing quite as powerful as the decision to die. What are physical objects? One absolutely doesn't expect that things fashioned by human hands can't be destroyed by human hands. When all is said and done, victory resides in the self. This is simply a story of my giving up my life to lead the way to victory. In the morning I went to the Naval District Personnel Office, told them my situation, and asked them to decide on my next assignment. I telephoned the personnel office at the Naval Aviation Department and requested a special-attack unit. In the morning I received an order to transfer to the No. 1 Air Attack Squadron of the 601st Air Group at Katori Air Base. After lunch I finally left my group. At long last, we received the order we've been waiting, and hoping, for. We'll go to Kokubu. The appointed day is the day after tomorrow. This will be to avenge my several hundred war buddies from the 503rd. I'll do it. I'll be decisive! We picked as many cherry blossoms as we could and ran back as fast as our legs would carry us, but the planes had gone to the starting line and were about to begin taxiing down the runway. They were far away, and we were sorry we couldn't run out to them. Motoshima's plane was late and went to the starting line right in front of us. Then the squadron leader's plane took off. It was followed by planes piloted by Okayasu, Yagyū, and Mochiki. The Type 97 fighters wagged their wings from left to right, and we could see smiling faces in all the planes. The plane piloted by Anazawa from the Twentieth Jinbu [Shinbu] Squadron passed in front of us. When we waved branches of cherry blossoms as hard as we could, the smiling Anazawa, his head wrapped in a headband, saluted us several times. Click! . . . when we turned and looked behind us, it was the cameraman taking our pictures. When every one of the special-attack planes had taken off, we just stood there for a long time, gazing at the southern sky, which seemed to go on forever. Tears welled up in our eyes. 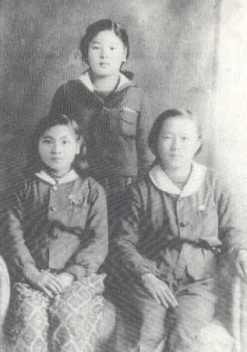 The two chapters on kamikaze pilot Yasuo Itabashi and high school student Shōko Maeda have several factual errors. Yamashita's introduction to Itabashi's diary and a note on the chapter's last page state that he took off on August 9, 1945, from Kokubu Naval Air Base on the southern island of Kyushu as a member of the No. 4 Mitate (Great Shield) Special Attack Squadron and was killed in action in Kingazan Bay off Okinawa (pp. 51, 80). Actually, he took off from Hyakurihara Naval Air Base, located in Ibaraki Prefecture about 50 miles northeast of Tokyo and over 600 miles northeast of Kokubu . No "Kingazan Bay" exists in Okinawa, but a Japanese source  indicates that Itabashi's squadron died in battle east of Kinkasan (an island) in Miyagi Prefecture, about 1,100 miles northeast of Okinawa. Although Itabashi's next to last diary entry dated April 7, 1945, indicates that he was going to Kokubu, and in April kamikaze attacks were directed exclusively toward Okinawa where the American fleet had invaded, four months later in August the American fleet had moved and several sorties of kamikaze squadrons were made from air bases near Tokyo. Yamashita's introduction to Itabashi's diary states that his older brother Origasa died in a special attack in November 1944, but Japanese sources that provide complete listings of men who died in special attacks  do not mention Origasa Itabashi's name, and even Yasuo Itabashi's diary entry dated November 28, 1944, does not mention that he died in a special attack, "I heard from Superior Flight Petty Officer Nishide, just back from Manila, that my older brother Origasa died recently in an attack on an aircraft carrier" (p. 65). Most likely Origasa Itabashi died in a conventional air attack. Yamashita also states that Yasuo Itabashi "saw action for the first time" in 1943 when "training at several air bases in Kyushu" (p. 51), but it is unclear what this could refer to since the Allies did not attack the Japanese mainland directly until the following year other than the Doolittle air raid on Tokyo in April 1942. The translation of Maeda's diary uses the name Jinbu Squadrons to refer to the Army's special attack squadrons that took off from Chiran Air Base, but the correct spelling is Shinbu Squadrons. Maeda's diary entry on April 12, 1945, mentions that the 20th Jinbu (should be Shinbu) Squadron had Type 97 fighters, and a footnote incorrectly states that these were Nakajima B5N1 Type 97 Carrier Attack Bombers, which the Allies called the "Kate" (p. 230). This was a Navy plane, so Army pilots from Chiran would not be flying such an aircraft. The 20th Shinbu Squadron members carried out their special attacks in the Nakajima Army Type 97 Fighter (Ki-27), nicknamed Nate by the Allies. 1. Hara 2004, 241; Osuo 2005, 231. 3. Hara 2004, 138-9, 144-51; Osuo 2005, 160-66. Osuo, Kazuhiko. 2005. Tokubetsu kōgekitai no kiroku (kaigun hen) (Record of special attack corps (Navy)). Tōkyō: Kojinsha.